PixelCNC is the premiere utility for generating a variety of 3-axis CNC milling toolpaths directly from image input. Translating graphic designs into CNC projects has never been this simple. No more messing around with tedious freeware or cumbersome subscription-based CAM software designed for industrial manufacturing. PixelCNC supports a variety of image formats, including SVG vectors, and 3D models can be imported as depthmaps too! A growing library of operations generates both your everyday conventional cutpaths and original new toolpaths you won't find anywhere else. CAM Innovation: By utilizing novel algorithms for transforming images and machining operation parameters into CNC toolpaths PixelCNC transcends the antiquated strategies of conventional manufacturing techniques. 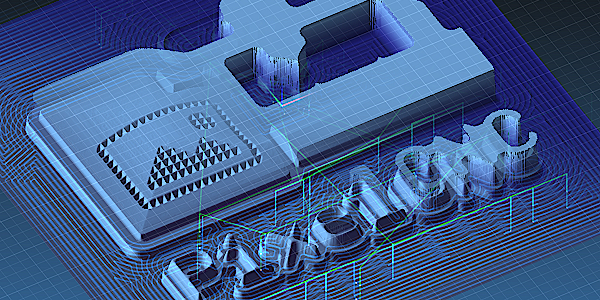 PixelCNC is faster than any other image-based CAM software out there: toolpaths are generated within seconds on a mid-range PC or laptop and G-code can be exported for just about any CNC controller via the new post-processor system. If you need a PixelCNC post for your CNC controller you can easily make one yourself within minutes or request that we make one for you! CNC Simulation: A simple and powerful built-in simulation system provides users with a preview of the material removal they can expect from generated toolpaths. No more 'cutting blind' the way some other programs expect us to by only displaying a 3D render of toolpaths themselves. With PixelCNC you can see what your operations' toolpaths are going to do to a workpiece long before you ever hit cycle start, and be able to adjust your operation parameters accordingly. At the end of the day: PixelCNC is fast, intuitive, and features a concise user interface that's designed to minimize complexity and maximize productivity. It's specifically designed to be the perfect CAM utility for creative DIY'ers who use a CNC mill/router to fabricate artistic works for fun and profit. Not only is PixelCNC a simple and powerful program for generating CNC toolpaths but it also offers the capability of generating toolpaths that cannot be found anywhere else. The purpose of these unique operations is to lend an interesting and totally original stylization to a workpiece that can't be had anywhere else. Instead of toolpaths serving only to remove material from where it shouldn't be PixelCNC's philosophy is to exploit the very nature of CNC itself so as to provide visually stimulating textures and patterns to works which would otherwise be practically impossible with conventional CAM software. Why PixelCNC? As a CNC hobbyist that runs an online crafting shop with my wife by day, and writes code by night, I have grown weary of the usual tools and workflows for creating interesting works on my CNC machine. Existing CAM solutions are either too slow, boring, complicated/tedious - or some combination thereof. I needed a tool that makes creating toolpaths and generating G-code as quick and painless as possible - without all the fuss of professional CAM packages or the shoddy performance and limited capabilities of indie software, free or otherwise. 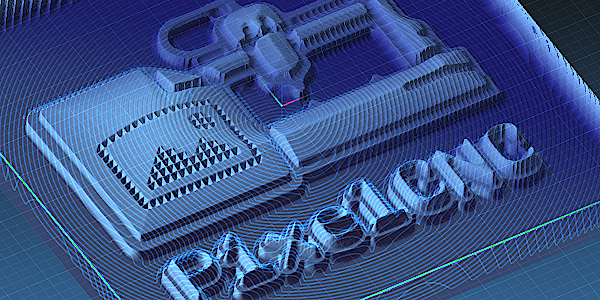 PixelCNC not only makes creating toolpaths easy, it makes it fun! For what PixelCNC can do I haven't found a price it doesn't beat. There do exist a few different CAM solutions which have some form of PixelCNC's capabilities, but most of these programs have too many options and features. This invariably entails a larger learning curve (and price tag) than I'm comfortable with. Most of these features and capabilities just get in the way of creating what I want to create. PixelCNC is offered to users for just a one-time payment roughly equal to the cost of a month's subscription to one of the popular professional CAM programs, and then users have it for life! But I already have a usable workflow! I had a software toolchain and workflow that I was happy with, for a while, considering the alternatives available. PixelCNC, however, has my old workflow beat by a long shot when it comes to getting an image design into a piece of material. Working with PixelCNC it's easy to get from an image or model to G-code in a minute flat, if need be. Now with the new 3D model import functionality users can transition at their own pace from a 3D model based workflow to one where they whip up what they need in their favorite image editing program and CAM off that. It's much faster and much more flexible than unwieldy 3D modeling and CAD workflows. My old 'conventional' CAM workflow was also limited to relief/emboss works. To do anything else (V-carving, profiling, etc) I had to resort to low-quality free software that was slow, provided limited options for toolpath generation, and there was no way to see what the final result would be like unless I went ahead and risked scrapping material by cutting blind. There was no simulation system built into the basic bare-bones minimal software that's available. Just the savings in scrapped material alone would've covered the cost of PixelCNC a dozen times over by now. Maybe you've already found something that does what you need and were able to pay for it in full to own it outright. CAM software is designed almost exclusively to produce toolpaths whose merit is their function, not their form. PixelCNC's novel one-of-a-kind stylized toolpath operations, such as the chevron, labyrinth, and conformal operations are that which could be artistically integrated and incorporated into the design and aesthetic of your own CNC creations. PixelCNC's unique stylized toolpaths are alone worth its humble price, and more operations are always being invented and implemented all the time. Existing PixelCNC customers get these new toolpaths and all future features/enhancements that become implemented over time at no extra cost. 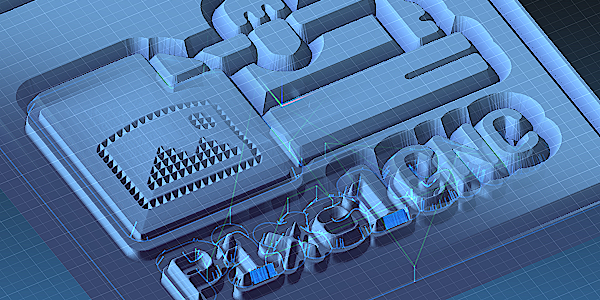 A downloadable free trial version of PixelCNC is available for user evaluation. It imposes a 10-minute time-limit per session and restricts exported G-code to 4000 tool motions per operation. The loading and saving of project files is disabled as well, otherwise the free trial is equipped with the same capabilities of the full version. Example images are available for users to download along with the free trial to test-drive PixelCNC's functionality and compatibility with their system before investing in a copy of the full version. If anyone experiences any issues with PixelCNC - error messages, bugs, crashes, compatibility issues, etc.. please let us know via the message board at the bottom of this page! Our number one goal is user satisfaction, period. At least one older version of PixelCNC is kept online in the event that something has become broken for some users with the latest version. 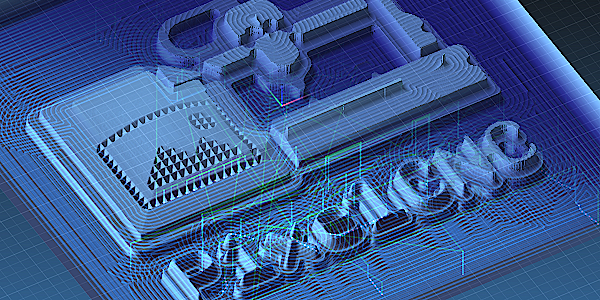 PixelCNC is alpha software that is still being developed - with new features and functionality being released every few weeks that has not been fully tested. 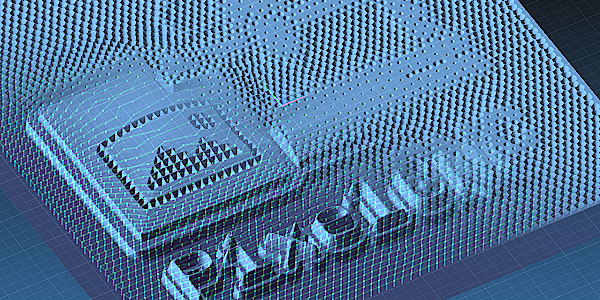 Users are always riding at the forefront on the cutting edge of PixelCNC's development. If the most recent version has problems users should try the next most recent version, and let us know of the situation via the messageboard. Vanilla run-of-the-mill toolpaths originate from industrial fabrication and its methodologies, they are a product of manufacturing instead of artistic creation. PixelCNC's ever-growing library of operations features your conventional toolpaths-of-industry as well as totally new and original toolpaths which will set any project apart from those created using conventional manufacturing-oriented CAM software. Machining tool marks are a thing of beauty unto themselves, and your industrial fabrication centric toolpaths can only get you so far! New operations and toolpath generation algorithms for producing unique textures, patterns, and even novel interpretations of a project's input image/model are being added all the time! Parallel: A tried-and-true operation, parallel contouring allows a depthmap image to easily be machined out of material in successive linear cuts. PixelCNC allows for parallel toolpaths to be at any orientation, with either conventional, climb, or mixed cutting. Chevron: Similar to the parallel operation the chevron operation allows for an interesting zig-zag pattern. Using the same parameters as the parallel path, with the addition of chevron width and height, you can achieve a wide range of chevron pattern types. Leave your step spacing at a larger value and let those toolpaths show through to achieve an interesting chevron pattern overlay on your final workpiece! Spiral: This is another contouring-style operation akin to the parallel and chevron except that the resulting toolpath, you guessed it, spirals outward. The origin of the spiral can be centered anywhere within the dimensions of the project. Spiral direction is controlled via the cut direction parameter. Labyrinth: The labyrinth operation generates a maze-like toolpath. Parameters to control randomness, axial symmetry, and rotational symmetry allow the user to produce a variety of interesting and novel toolpaths that give a fractal-esque appearance to their works. Stipple: Not all artistic endeavors with a CNC should be limited to cutting out reliefs. The stipple operation generates a toolpath that can be used with ball-nose or v-bit cutters to depict a grayscale image, either by pecking stipples meant to be black on a white background, or white stipples on a black background. Parameters allow for the adjustment of the sizing and displacement of stipples as a product of the light and dark areas of a project image by employing a simple particle advection simulation. Medial-Axis Carve: Also known as 'v-carving' or 'b-carving' (depending on the cutter used) this operation allows black/white designs and patterns to be used in the generation of a toolpath that follows the medial axis of the depicted shapes and forms in the image - varying the depth of cuts along the medial-axis to modulate their width in order to cut out the original forms and shapes themselves. This machining operation is great for creating varied 3D and depth from simpler image input which lacks interesting depth features. Horizontal: Just as with conventional machining sometimes you just need to quickly remove a lot of material. The horizontal milling operation serves well as a roughing pass for jobs with significant depth and a resulting abundance of material to move. The horizontal milling operation is also great for achieving an interesting terraced effect from depthmap input images. Outline: Any gray level in the input image can be chosen to delineate the boundary separating dark/light areas. This outline boundary can also be offset inward/outward to produce the final resulting toolpath which the tool should cut to along at a given cut depth until a final max depth is achieved. Conformal: This is effectively the same as the parallel operation with the addition of the input image being used to apply a perturbation to the cut paths. The image's gradients nudge the toolpath perpendicularly to give a contour-following appearance. The perturbation can be smoothed so that cuts traverse the geometry in a more gradual sloping way. Pocketing: This is a cross between the Outline carving and Horizontal milling operations. A threshold value is set to indicate the delineation between light and dark areas of the image that should be used as the pocket contours along with an offset value for tool radius compensation or just making pockets larger/smaller than the threshold boundary. Pockets are cut to the specified 'max depth', irrespective of the project's actual 3D contours, in 'cut depth' increments. This is useful for clearing flats around relief carvings or other effects. While PixelCNC is still under development existing customers receive updates which include bug-fixes, interface improvements, and optimizations. As a show of appreciation for customers' support they are also granted all of the newest features and capabilities as they are implemented over time: new operation types and toolpath generation modes, simulation system improvements and enhancements, and more - free of charge! As new capabilities and features are added to PixelCNC, increasing its value and utility as a tool, they are accompanied by incremental price increases. Buy your copy now while PixelCNC still has it's early-access price-tag and get these new features free as they're added! 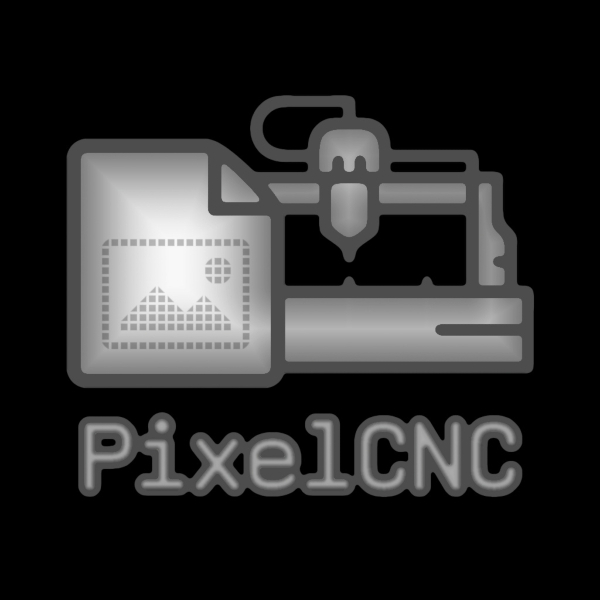 PixelCNC has been tested to run on 64-bit versions of Windows 7, 8.1, and 10, without issue. It is recommended that PixelCNC be run on Windows 7 or newer. PixelCNC will technically work on Windows XP (Service Pack 2) but it relies on OpenGL 2.1 compliant graphics hardware. This implies that just about any computer built in the last decade should be capable of running PixelCNC. If you have any problems please report your experience via the messageboard at the bottom of this page and we'll see if we can't get you up and running! The 32-bit version of PixelCNC is offered as a fallback version for users limited to a 32-bit version of Windows. The 64-bit version is recommended for all other users as PixelCNC's algorithms can be rather memory-intensive. 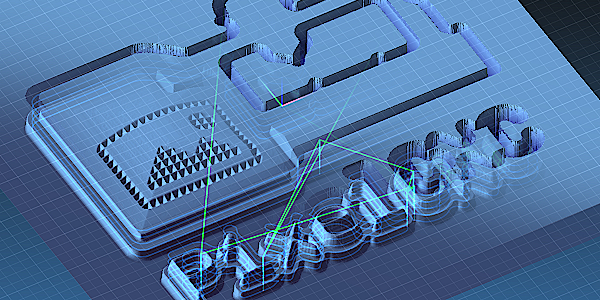 This can result in using up the allotted memory that's made available to PixelCNC when working with complex projects that have numerous cut paths. This is usually about a gigabyte of memory regardless of how much physical memory there is installed in the system. The 64-bit version of PixelCNC is not limited in the amount of system memory that it can utilize, and will not exhibit memory allocation errors when working with complicated projects. TGA2STL is a free command-line utility for converting raw uncompressed TGA/Targa image files into STL/Sterolithography 3D meshes. This was a utility I wrote to circumvent using Blender to create meshes with redundant triangles removed - because using Blender was slow!